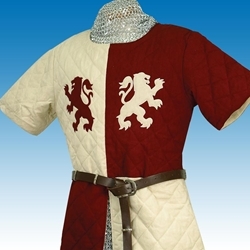 This heavy, quilted 100% cotton gambeson is quartered in off-white and blood red with two lions rampant on the chest. Can be worn with or without mail. Dry clean only. Choose S/M or L/XL.